My specific goal was to charm my way into two particular boys’ lives. This would be our first meeting and I wanted to leave an impression…preferably a good one. I have learned over the years that using food is a lot quicker and a lot less work than charm alone. So I reached into my back pocket and pulled out one of my oldest and most reliable food-tricks: Worms ‘n Dirt. 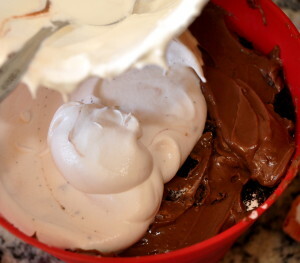 This appealing and enticing dessert is ridiculously easy: pulverized Oreos, pudding, whipped cream, and worms, preferably of the gummy nature, all cleverly disguised in a flower pot. It works. Every time. The destination? The home of our good friends, Lisa and Tague Harding. They have seven children. To me, it might as well be seventeen. Their age-range is six to 28. In real life that translates to kindergarten or elementary school or high school or college OR military or marriage. Wow. The two youngest, Phillip, almost 8, and Zach, 6, were adopted in 2008 as babies from from Amani Baby Cottage in Jinga,Uganda. They were my target. 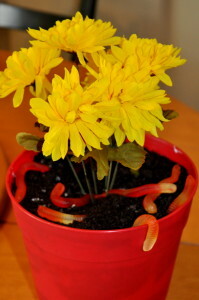 But first I had to make the Worms ‘n Dirt. Easy greasy. Clean the flowerpot. Really. Not to is just gross. Make the 2 boxes of pudding according to directions (Don’t try to be chintzy on the pudding like I did or you’ll regret it when you don’t have enough to fill the flower pot. Experience speaketh.) Chill in fridge. 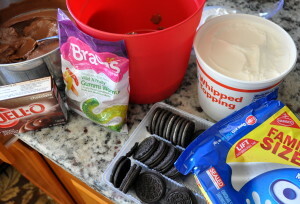 Grind all but four (4) of the Oreos in the food processor. Add the clean spade if ya wanna. It makes it even cuter! Eat the four Oreos that you didn’t grind. Impress all your family, friends, potential friends, and neighbors. But back to the task at hand: We arrived at the Harding home and were greeted by Tague and Lisa, youngest daughter, Ruth, Phillip, Zach, and Mayzee, the peppy puppy. I obnoxiously announced in a too-loud voice that I had brought a flower to Lisa and then turned to ask the boys what they thought of that. “It has worms,” was their only reply. It was later that week, though, that I learned that my goal of making a good impression had been attained. Lisa and Tague were getting in their car to come to our house; they were skating and Lisa was leaving them last minute instructions to obey Ruth while Mom and Dad were gone. When they asked where they were going, Lisa replied, “to Mr. Tim and Miss Karen’s house. You know, the one that brought the Worm’s ‘n Dirt.“ Whining promptly followed when they realized it was an adult only gathering. YES, YES, YES!! Ah,making good impressions is such tough work! Love it, Karen. Even as I was “making” this with you, I could feel what a huge success this was going to be. 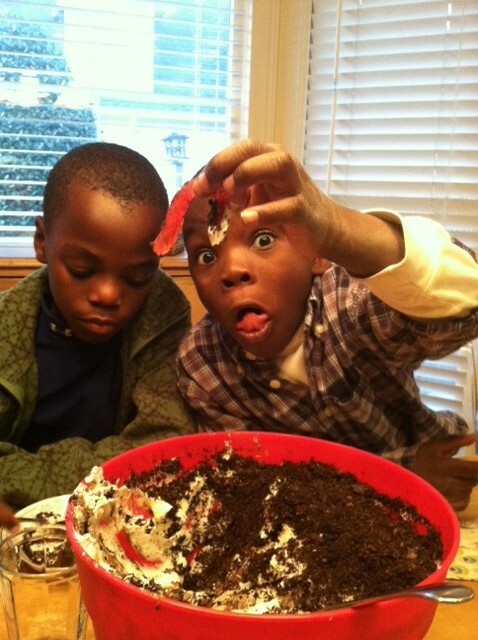 And what a great blog post, combining real life with with worms n dirt…easy enough if boys are involved, huh? Will enjoy following. Kandy, Thanks…small following now, but glad you “see my HEART” in what I want to do. I love and miss you! Great story! I have always wanted to make that, maybe this weekend for someone. I want to see a picture if you do!! Nancy, thanks for subscribing! Escapades is a great word!